Seventy years ago this week, Orange County’s most brutally suppressed strike began with a bite. On June 15, 1936, at the break of dawn, about 200 Mexican women gathered in Anaheim to preach the gospel of huelga—strike. Four days earlier, about 2,500 Mexican naranjeros representing more than half of Orange County’s crucial citrus-picking force dropped their clippers, bags and ladders to demand higher wages, better working conditions and the right to unionize. The women spread across the groves of Anaheim, the heart of citrus country, urging workers to let the fruit hang. Twenty Anaheim police officers confronted the women; they refused to disperse. At some point there was an altercation, and 29-year-old Placentia resident Virginia Torres bit the arm of Anaheim police officer Roger Sherman. Police arrested Torres, along with 30-year-old Epifania Marquez, who tried to yank a strikebreaker—a scab—from a truck by grabbing onto his suspenders. Orange County Sheriff Logan Jackson deputized citrus orchard guards and provided them with steel helmets, shotguns and ax handles. The newly minted cops began arresting strikers en masse, more than 250 by strike’s end. When that didn’t stop the strike, they reported workers to federal immigration authorities. When that didn’t work, out came the guns and clubs. Tear gas blossomed in the groves. Mobs of citrus farmers and their supporters attacked under cover of darkness. What county residents tried to dismiss as a fruitless strike quickly escalated into a full-fledged civil war in which race and class were inseparable. The Mexicans of Orange County, the county’s historical source of cheap labor, were finally asking for better working conditions; their gabacho overlords wouldn’t hear it. And so both sides fought for a month until the lords of Orange County won. Wonder why Orange County trembles whenever its Mexicans protest? Welcome to the Citrus War of 1936, the most important event in Orange County history you’ve never heard of. 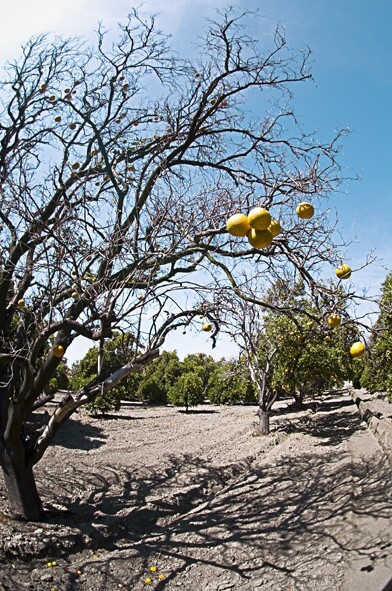 The Citrus War erupted at a volatile point in California and Orange County history. It was the nadir of the Great Depression, and radicalism was in the air. Two years earlier, writer Upton Sinclair nearly became California’s governor by campaigning under the slogan EPIC (End Poverty in California). 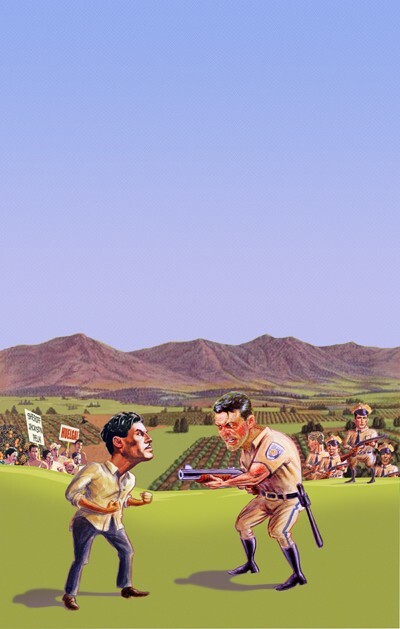 Blood spilled across the fields of the Golden State as law enforcement and growers joined to brutally suppress unions. It was the year crusading journalist Carey McWilliams of the Pacific Weekly wrote a series of exposés about California’s agricultural industry that he would publish three years later in his classic Factories in the Field. Orange County was a bucolic exception to California’s troubles. Its 51 orange-packing houses and more than 5,000 growers carefully crafted a national image of Edenic stability. Gorgeously decorated crates with labels such as Altissimo, Esperanza and Miracle portrayed a mythical California in which the Pacific Ocean gave way to orange groves that swept up to the foothills of the Santa Ana Mountains; every crate of oranges offered paradise to a weary nation. The country rewarded Orange County for its dreamscape; the Orange County citrus industry brought in $20 million in 1938 alone. “By the blessing of nature, Orange County had the lion’s share of the summer crop [of oranges] when the consumer was thirstiest,” wrote UC Irvine professor Gilbert G. González in Labor and Community: Mexican Citrus Worker Villages in a Southern California County, 1900-1950, his 1994 history of Orange County citrus pickers. At its height, 75,000 acres of Valencia orange groves covered the county, mostly in Brea, La Habra, Anaheim, Orange, Villa Park and sections of Irvine. Growers depended heavily on seasonal Mexican laborers, who brought with them a memory of unionism. In 1928, according to González, 14 Orange County residents participated in the first Southern California chapter of the Confederación de Uniones Obreras Mexicanas (Confederation of Mexican Workers Unions, or CUOM), a union for Mexican laborers in the United States organized through the Mexican consulate; the Great Depression soon smashed CUOM, and an alternative union emerged: the Confederación de Uniones de Campesinos y Obreros Mexicanos (Confederation of Mexican Farm Workers’ and Laborers’ Unions, or CUCOM). Whereas CUOM reported directly to the Mexican government, CUCOM’s founders had their roots in the Industrial Workers of the World, better known as the Wobblies, one of the most powerful and most radical unions of the 1920s. Under the direction of William Velarde, CUCOM led one of Orange County’s first strikes in 1933, when 125 Laguna Beach vegetable pickers left their jobs demanding 30 cents an hour. CUCOM organized other successful strikes in Orange County’s celery, squash, pea and lettuce industries, and Orange County’s naranjeros—who made up the bulk of Mexican laborers in the county at the time—took notice. On Oct. 11, 1935, Mexican consul Ricardo Hill told more than 2,000 citrus pickers at Anaheim’s Pearson Park that the consulate would support the naranjeros in their struggles for better wages. By the end of 1935, CUCOM set its sights on King Citrus. On March 18, about a month before the start of the Valencia orange harvest, CUCOM organizers presented growers with the demands of Orange County pickers: 40 cents per hour for an eight-hour work day instead of 27 cents; free transportation and tools; the abolition of a bonus system that promised riches to workers who stayed with one grower for an entire season but that workers rarely saw; and the right to a union. If the growers didn’t grant the naranjeros these points, they would strike on June 11. The Citrus War was about to begin. On June 11, at 2 p.m., 2,500 naranjeros left the orange groves. Orange County’s still-emerging Latino community rallied behind the naranjeros. Grocers extended credit to strikers and their families. Wives joined their husbands on the line. Musicians penned corridos in honor of the strikers. Mexican consul Hill pledged his support, along with Lucas Lucio, a Santa Ana activist who served as a liaison between Orange County’s Latino community and its Anglo leaders. Citrus growers fought back with their own fliers: Orange County’s conservative newspapers. A week after the strike began, orange growers spokesperson Stuart Strathman told the Register, with no evidence whatsoever, that the strikers were Cardenistas, followers of Mexican president Lázaro Cárdenas, and fomenting a “little Mexican revolution.” Calling someone a Cardenista was worse than being labeled a Red that year: earlier that spring, Cárdenas infuriated the United States government when he nationalized Mexico’s oil industry, usurping American oil interests. This summarized the philosophy of Jackson, a man usually brushed aside amongst the Lacys, Musicks and Caronas in the annals of the Orange County Sheriff’s Department. But Jackson’s actions during the Citrus War cemented the relationship between the Sheriff’s Department and the county’s political and business elite, a relationship that continues to this day. Even before Jackson penned his Register guest editorial, the sheriff offered growers armed escorts to drive scabs to and from the groves. He held almost weekly strategy meetings with the district attorney’s office and growers. Jackson invited immigration officials to deport any illegals his deputies detained, and helped the California Highway Patrol set up a radio station hidden in the groves to better coordinate activities. Most crucially, Jackson deputized about 400 men, mostly the private guards of orange pickers. The special deputies also began haunting the strikers’ meeting—in one case, according to the Los Angeles Times, over 400 officers ended a meeting in Brea. These deputies executed Jackson’s mandate to keep order by arresting strikers and sympathizers on the flimsiest of charges. On June 16, for instance, the Register reported a man named Frank Medina was arrested because he was “interested” in the strike. Others were charged for trespassing, vagrancy or minor traffic infractions such as a busted taillight, driving on the wrong side of the road or—incredibly—improperly signing a vehicle registration card. On June 27, officers arrested Charles McLaughlin, Communist Party USA congressional candidate, for trespassing, vagrancy and “having no visible means of support.” Almost everyone received immediate 30- or 60-day jail sentences, with no jury for deliberations. With Jackson’s backing, the orange growers grew bold. They asked the federal government to deport Hill, the Mexican consul, on charges he was behind the strike; that assertion ignored the fact that Hill had urged strikers to leave CUCOM, which he argued was filled with radicals. Hill didn’t leave, but the idea that the strike wasn’t homegrown but rather controlled by outside interests planted itself in the Orange County consciousness. As the weeks passed with no progress in labor talks, and as the deputies increased their harassment, the strikers turned to violence. Strikers smashed car windows, assaulted strikebreakers at their homes or simply rushed into orange groves and beat them. On June 26, pickers burned the truck of foreman Joseph Hernandez in front of his Anaheim home. On July 1, strikers went into the camps and attacked the remaining pickers, according to newspaper reports, with “heavy chains, clubs, knives and other weapons”; in one case, those weapons were oranges. Two days later, strikers in La Habra attacked a truck carrying strikebreakers with rocks, shattering its windshield and injuring scores of scabs. That day, Jackson and Orange County District Attorney W.F. Menton met with packing house officials to deputize more guards and arm them with taxpayer-supplied shotguns. Orange County now had 400 emergency deputies. Police departments across the county asked merchants not to sell ammunition to Mexicans anymore. It was time to end the strike. At 2 in the afternoon on July 6, four carloads of Mexicans visited the Cooper Ranch in Fullerton. Guard M. A. Patterson ordered the caravan to stop. The cars slowed. About 20 Mexican laborers spilled out. Patterson shot into the air. The strikers didn’t stop. They took Patterson’s shotgun and beat him over the head with it. Then they rushed the scabs. Similar attacks spread across Orange County’s groves for the next two days. Strikers fought with “iron bars, clubs and their fists,” according to the Register. Guards responded with guns. In La Habra, a guard shot Angel Rojas in the leg “and would have injured others had not the gun jammed.” Deputies took Rojas to the hospital, where doctors amputated his leg. Then they turned him over to deputies to serve his jail time. The county Board of Supervisors, responding to requests by growers, soon authorized Jackson to purchase “an arsenal of such size as to be able to cope not only with the present citrus strike but with future strikes.” Jackson ordered shotguns, clubs, tear gas and other chemical weapons that would cause “distressing illnesses” to those targeted. “This is no fight between orchardists and pickers,” Jackson told the Register. “It is a fight between the entire population of Orange County and a bunch of communists.” He also gave deputies a fateful order: “Shoot to Kill,” splashed across the front page of the Register—and soon, the world’s newspapers. White vigilante groups soon began attacking strikers at halls during nighttime raids. The worst incident occurred on July 10, when 40 men, under cover of night, threw tear gas bombs into a Placentia hall. Strikers rushing from the building were beaten by club-wielding vigilantes. When the smoke cleared, Alfonso Orosco, who testified at the trial of Communist Party candidate McLaughlin, was on the ground, unconscious. “Whether he was clubbed, or had struck his head on the brick wall while running to escape, could not be decided,” the Courier reported. The Placentia attack sparked outrage in the Latino community; CUCOM demanded an investigation. Over 1,000 people protested in Los Angeles on behalf of the strikers. Growers denied responsibility, but a July 8 Register report revealed that growers who attended a “secret meeting” in Placentia that day had decided to “fight to a finish.” Strike leaders further noted that Placentia Police Chief Gus Barnes was monitoring the meeting from afar but left just as the vigilantes swooped in. Two days after Jackson’s statement, an anonymous note made its way to the Placentia City Council chambers. “If the strikers cannot have protection,” it promised, “we can use dynamite.” That got the attention of state and national officials, who swooped into Orange County to defuse the crisis. Edward H. Fitzgerald, commissioner of conciliation for the U.S. Department of Labor, warned Jackson that his “shoot to kill” edict was souring relations between the United States and Mexico. A San Diego state Assembly member called for a state investigation; Jackson told reporters the man was clearly a communist. Fred West, an official with the California Federation of Labor, arrived on July 11 and was arrested four days later by Musick for talking to strikers on a street corner. “All law had been suspended in Orange County in an effort to terrorize and starve strikers into submission,” West wrote in a private letter to his superiors. The terror campaign was working. With over 200 supporters in jail, the pickers’ once-solid unity began to fray. Soon, former Mexican President Adolfo de la Huerta and Los Angeles Times publisher Harry Chandler—who owned a citrus ranch in Brea—offered to mediate between strikers and growers. They reached an agreement with the growers, which called for a minimal raise and the granting of all other demands except the right to unionize. The strikers, under the leadership of William Velarde, rejected the offer. At this point, Lucio and Hill joined Jackson in trying to drive Velarde from the county. Velarde went underground, sneaking into Orange County in the dead of night and urging strikers to fight for a union. Deputies finally captured Velarde, and Hill and Lucio announced they had reached an agreement with growers on July 27. No union. But the growers and Sheriff Jackson wouldn’t forget until all the Mexicans were behind bars. The day after the strike, Orange County Superior Court Judge H.G. Ames ordered 115 Mexicans who were arrested on rioting charges to enter a YMCA gymnasium that had been turned into a makeshift courtroom to accommodate everyone. The district attorney’s office had delayed their hearing twice already and sought to impose a maximum sentence of two years in state prison. In its year-end review, the Orange County grand jury gave Jackson a clean bill. Three grand jurors were citrus farmers; one, A.J. McFadden, was also an executive with the Irvine Company. Strikers wouldn’t get their justice until 1939, when a congressional investigation found that Orange County growers illegally blacklisted people and colluded to crush the strike; no charges were filed, however. That was also the year Carey McWilliams packaged his Factories in the Field series from 1936 into a nationally released book. Factories in the Field, coupled with John Steinbeck’s The Grapes of Wrath and Dorothea Lange’s portraits of Okies, introduced America to the brutal conditions in California’s agricultural fields. Even years later, McWilliams still couldn’t shake the strike. In his 1946 Southern California Country: An Island in the Land, he remembered being “astonish[ed] in discovering how quickly social power could crystallize into an expression of arrogant brutality in these lovely, seemingly placid, outwardly Christian communities. The orange trees on the corner of Santa Ana and Helena streets in Anaheim are bearing again. Their fruit hangs from the branches, bright and plump, awaiting pickers. But the grove is quiet this Saturday morning, save for some kids who trail their hands along the chain-link fence that keeps the trees free from trespassers. And so, the fruit falls to the ground and rots. Nearby, in a vacant lot that was an orange grove not even five years ago, bulldozers lie silent. They’ve pushed the earth around in ways that suggest another home development is coming soon. It won’t be long before the last remaining orange grove in Anaheim, too, falls victim to progress. This is the spot where 200 women clashed with Anaheim police, the area where Virginia Torres bit the Anaheim police officer so many years ago and the Citrus War began. When that orange grove disappears, it will join the 1936 Citrus War in Orange County’s dustbin of history. The Citrus War solidified the county’s distrust of its Mexican population, which we see whenever they take to the streets. It created a Sheriff’s Department that can do anything with the full support of Orange County’s fathers. It’s a cliché, now, to talk about the Orange Curtain, but back in 1936, men like McWilliams must have experienced the place that way—isolated from the world, beyond the reach of state or federal officials, a free-fire zone for ranchers and men of quality. It’s still not mentioned. Most of the strike’s survivors are dead, and those who remember it do so through the mind of a child. Three dissertations have been written about the 1936 Citrus War, but they’re confined to university special collections, far from the public discourse. McWilliams is the strike’s best chronicler, but his work nowadays appeals only to historians. There’s little or no mention of the Citrus War in the main Orange County chronologies or history books. Most of the packing houses where the growers and Sheriff Jackson held their secret meetings are gone. Even the official historian at First American Title Insurance Company, one of the county’s largest repositories of historical Orange County photos, had never heard of the strike when I told him I was doing research on the story. When we talk about our long-gone citrus industry, we return to the orange crates, the last remnants of King Citrus. More than just art, the crates nowadays pass themselves off as snapshots of the past. 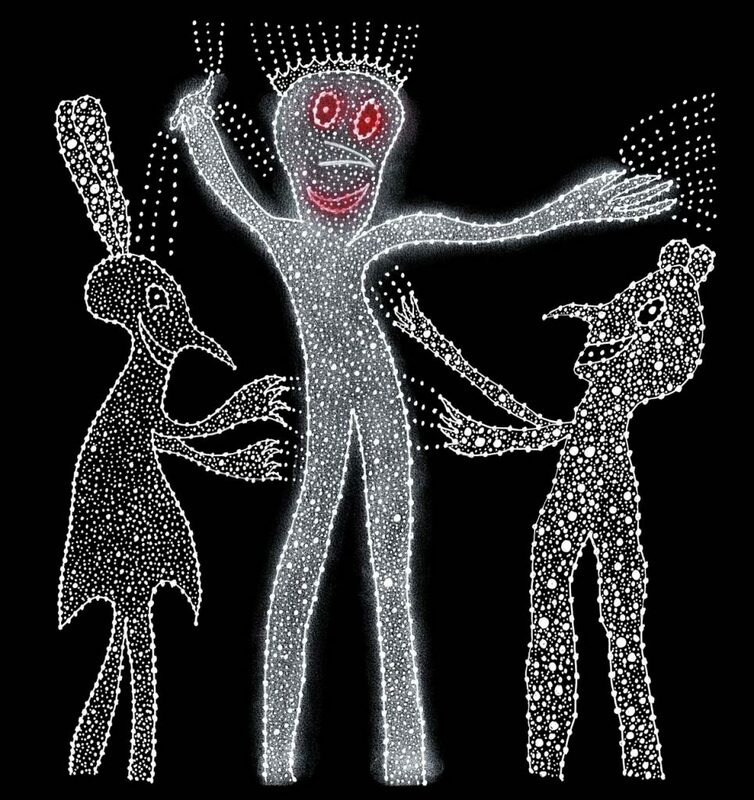 Idealized images become real history; real history disappears. The growers win; the strikers lose again. In the archives of Cal State Fullerton’s Center for Oral and Public History, there’s a 1986 interview with Cecil J. Marks, manager and executive secretary of the Orange County Farm Bureau during the Citrus War. It was under his direction that the Farm Bureau lobbied the federal government to deport Hill, the Mexican consul. Now, 50 years later, Marks was still insisting that Mexican citrus growers never had reason to strike.